Today I’m spotlighting the adventure/fantasy series by Amy Lignor, Tallent & Lowery! Let me tell you about each of the books. In 1902, in a dark room on the fifth floor of Carnegie Hall, thirteen people came together to continue a tradition that had been set in stone thousands of years before. In 2012, Leah Tallent is Head of Research at the New York Public Library. Stoic and stable, brilliant and cynical, she has forever enjoyed her existence among the book stacks. But even with her unparalleled intellect, there was no way to know that on the historic steps between America’s famous lions, she would become involved with a crazy man on a fanatical quest. Gareth Lowery has spent his life searching for the ultimate artifact that he is certain exists. His life’s pursuit has been to retrieve twelve keys hidden by men whose job it was to protect the single biggest secret ever kept. To find the keys he must enlist the help of an unwilling guide who, unfortunately, knows much more than he bargained for. From the first page to the last word, this fantastic duo become immersed in a whirlwind treasure hunt with historical and passionate repercussions. From the strange and eerie Winchester House to the blustery darkness of Loch Ness, Gareth and Leah will quickly learn that the theory of duality is correct: For every bad there is a good and, for Heaven, there most assuredly exists…Hell. After going up against a man who believed he was the Devil, himself, the beloved characters from 13 – Leah Tallent and Gareth Lowery – are beyond exhausted. Now they are about to embark on the most terrifying journey imaginable…a trip to meet Leah’s parents. When Leah arrives where the ‘home fires burn,’ her sarcasm burns even brighter, while Gareth Lowery – the handsome adventurer – uses his charm to sway the ‘odd’ Tallent clan. But when a frightening call from Gareth’s sister arrives telling him that her love has disappeared, the daring duo is soon running away from one horrific situation directly into another. A new puzzle from the past has come to life. Following clues left behind, the courageous couple becomes embedded in a world filled with liars, killers and greed. Yet again, they must find the answers and stay one step ahead of true villains who are determined to make sure that – this time – Tallent & Lowery do not survive. With their second battle behind them, Leah Tallent and Gareth Lowery find themselves still knee-deep in hell. What should’ve ended with a celebration of passion wrapped in each other’s arms becomes a nightmare once more, as a mysterious man demands Leah to return home, or else her beloved father will be found at the bottom of the sea. Scrambling to figure out what’s happened Tallent & Lowery walk in on a family that has literally gone insane: A mother filled with accusations, three sisters who wish them nothing but certain death, and a frightening story of a blood-red eye that leads to a puzzle with immense repercussions. 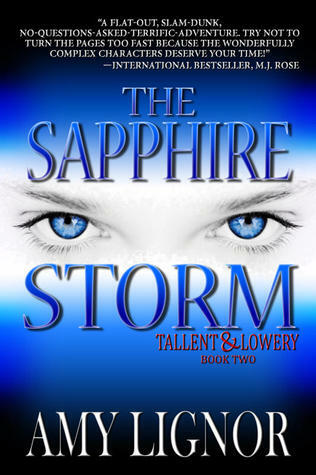 The woman named Anippe who readers questioned in The Sapphire Storm is back, with an item in her possession that will have Tallent & Lowery heading out on an adventure based on pure emotion and ultimate fear – where victory may just depend on their willingness to sacrifice each other. The time has come for Tallent & Lowery to go head-to-head with the mysterious voice from 13, as a villain is unveiled…and a war begins! Personally, my own favorite duo out there in America is the same duo that brought about ‘Tallent & Lowery’ in the first place. Patience and Fortitude, the majestic lions that sit in front of the NYPL, not only greet millions everyday, but they also protect the home, so to speak, of Leah Tallent. Sherlock and Watson are probably the most famous detective pair out there in the literary world; when it comes to other media venues, you have everything from Crockett and Tubbs to Scooby-Doo and Shaggy to Batman and Robin. Various daring duo’s have always graced the screens – big and small – and have always served up the perfect banter and wit in books we’ve come to love. With Leah Tallent & Gareth Lowery, I wanted to draw on all of these pairs in very subtle ways. With Leah’s happy (sometimes not) sarcasm and dryness, mixed with Gareth’s easy-going manner and love for her – their combined passion for solving these puzzles have drawn readers to their sides. To me, no matter what unique web they find themselves trying to unravel, it’s their strength as a duo that makes the book a success. When the partners happen to be male and female (Nick and Nora Charles, for example), they can also bring a true bond into the book, which adds to the power of the story. Leah Tallent has certainly gotten into some dire situations in books; 13, The Sapphire Storm and now, The Hero’s Companion. Yet, it’s not her intelligence or her way of reasoning things out that saves her – it is her partner, Gareth Lowery, who makes sure that Leah always has something worth fighting for. Gareth, of course, is the one who basically ruined Leah’s quiet librarian life in the first place when, in 13, he appeared inside the basement of the NYPL to retrieve a frightening book that’d been buried in the cornerstone of the building. He expected to discover the next steps he had to take in order to complete a lifelong mission of his. What he never expected was to discover the hard-headed, smart-mouthed, warm-hearted librarian who would literally be the brain and soul he needed for the rest of this life. Being able to take the detective aspects and combine them with the romantic aspects of literary partners (insert pretty much all of Jane Austen partners here), has allowed ‘Tallent & Lowery’ to become far more than just banter and wit. And…with the next four novels to come, readers will be more than surprised when they find out that this pair may just have to live with the fact that their adventures and puzzle-solving could lead to a break-up that neither saw coming. When it comes down to duo’s, the literary world has offered more than its fair share. ‘Tallent & Lowery’, hopefully, will become one of those teams that will never be forgotten. Amy is offering one commenter an ebook collection of all three books in the Tallent & Lowery Series! Posted on November 19, 2013, in books, free, Giveaway, guest post, reading. Bookmark the permalink. 4 Comments. The books sound fabulous and I would very much like to win the collection. Liza2write@yahoo.com. I want to read these books. Thank you for the chance to win!